Under the patronage and presence of H.E. 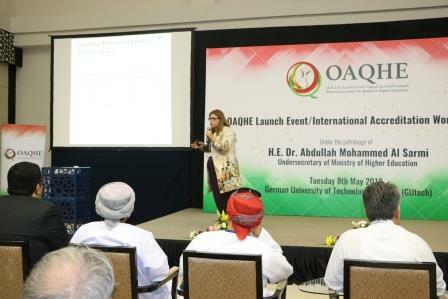 Dr. Abdullah Mohammed Al Sarmi, Undersecretary of the Ministry of Higher Education, The Oman Association for Quality in Higher Education was formally launched on the 8th of May, 2018 at the German University of Technology in Oman (GUtech). The event which focused in its theme on the international accreditation of higher education institutions was attended by over 100 experts in the field of accreditation and quality assurance including Dr. Salim Razvi, CEO of the Oman Academic Accreditation Authority ; Mrs Jokha Al Shukaili, Director General of Private Universities and Colleges and several University Vice Chancellors, Deans and Quality Director. The daylong event involved two parallel panels: one on ABET and QAA and the other on AACSB and EQUIS accreditation and a keynote address delivered by Dr. Narimane Hadj-Hamou, Founder and CEO of the Center for Learning Innovations and Customized Knowledge Solutions (CLICKS) who was invited to give a talk on “Accreditation in the GCC Region: Developments, Challenges and Future Opportunities”. In her keynote address Dr. Narimane presented an overview of the latest development in the area of accreditation across the GCC countries and shared the commonalities and differences between the different External Quality Assurance Agencies Systems. She has also shared with the audience some of the challenges faced with the implementation of QA and accreditation at both regional and national level as well as at the institutional level. Dr. Hadj-Hamou concluded her talk with some proposed strategies to better synergize the significant efforts done by various GCC countries.